As monumental events unfolded in the past week, I was mostly in a state of ‘dumbfound shock’ as I watched the trajectory of South Africa being diverted from a hopeful and promising developing nation to the destiny of Zimbabwe, linked at the hip by our border and our government. I can recall no other week where the self-interest of politicians has been so brazenly thrust ahead of the welfare of the country’s citizens. Having had extensive direct exposure to the mindset, rationality and history of Malusi Gigaba – the ex-Minister of Home Affairs, who has, as of last week, been promoted to one of the most important positions in the land: Minister of Finance – I thought it was my duty to share my experience. Some history. In a few years heading into 2016, I was involved in the provision of English Courses, primarily to foreigners, who came to Cape Town to study English. It was a real pleasure promoting the interests of young Africans from non-English-speaking Africa, financed by their companies or their parents to learn the language of business. The course and accommodation cost money – these were well-heeled young adults who flew in (from Angola, Mozambique, Gabon, etc), and SA visas, although understandably cumbersome, were forthcoming. They finished their courses and returned to their countries, families and corporate jobs. Then suddenly there was a change: visas were abruptly halted under Gigaba’s helm. We as a collective body of language schools in distress (EDUSA), pleaded with the Department of Home Affairs (DHA). Although there was some confusion about where we stood, (under which category of SSETA), the problem could have been solved overnight by the DHA. Our students used to arrive with a return ticket, health insurance, proof of funds…basically every conceivable condition to prove they were not refugee/immigrant threats but genuine students who would spend, bring revenue to SA and go back home. My school even provided a guarantee that the students would be on that return flight after their course. Our pleas were ignored with total disdain, even after undertakings from an official in the highest echelons of the DHA (Phindiwe Mbhele, Director: Corporate Accounts Immigration Services) who promised a swift resolution but was hamstrung by the political quagmire that prevailed under his Minister, Malusi Gigaba. It was a complete fiasco. Numerous schools, including mine, went bankrupt. I had to retrench six staff, all single parent mothers, of whom five are still destitute and desperate to find a job. I’m told (after the demise of my school) that EDUSA charged the DHA with ‘unconstitutional denial of income’ in court, and only then have visas been granted sporadically. 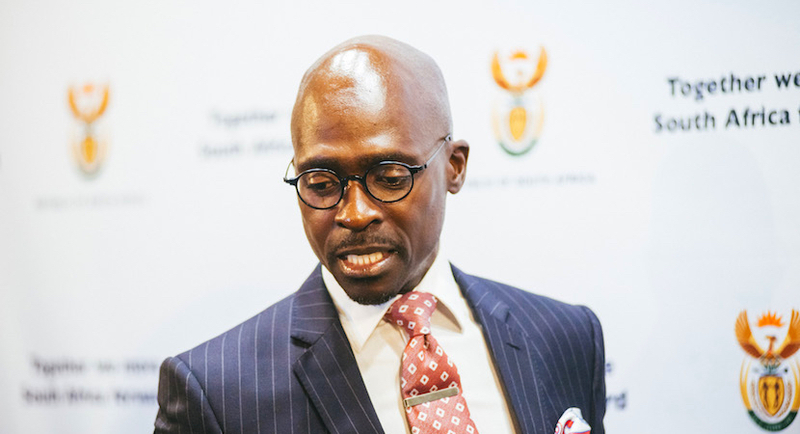 "I don't ask questions, I simply comply with the instructions given to me,"said finance minister Malusi Gigaba yesterday. Surprised at junk? And there I lay my claim for you to decide on Gigaba’s competence. I must add I have never met Gigaba, but only had interactions and an undertaking from his Director of Immigration Services, whose diligent efforts were thwarted by his Minister. I’m told my chances of meeting Honourable Gigaba are far higher if I attended the fashion shows of Cape Town; he has a weakness for clothes and beautiful women. I make no claim lightly, but only with supporting evidence. Regarding his weakness for beautiful women, I recount the story of his interaction with New York Fashionista Buhle Mkhize in 2015. Although Gigaba initially publicly denied it, his dalliance started in July 2014, lasting an entire year. Mkhize who is married says she met Gigaba on Instagram and realised they shared the same sense of humour. “By the end of July he’d started sending me private messages that were very basic at first but quickly graduated to flirting. The messages were flattering but uncomfortable, I am married and had had a relationship with a public figure in the past and hated what comes with it so this wasn’t the route I wanted to take even if I was single,” Mkhize said. The exchange of private messages on Instagram quickly escalated to phone calls and text messages. Eventually, Gigaba arranged for Mkhize to visit him in Cape Town. Media reports allege that gifts and presents for his fashionista friend amounted to R288 000, and this affair was on the eve of Gigaba’s marriage. Where I ask, does a ‘humble Minister’ obtain R300K for his extra marital fling – has anyone asked what is the funding source of this extravagance? On this evidence I rest my claim that Gigaba is a liar and a cheat, to his wife and family. Malusi Gigaba as new SA finance minister? Possible new FICA requirement: a long-form birth certificate. To prevent phishing or something. Do we want this man to represent us in high-profile meetings with International financiers and governments, wearing the hat of South Africa’s Minister of Finance? He seemed to have spent an inordinate amount of time cavorting with this woman (presumably his avalanche of messages was done during ‘government time’, when at a safe distance from his wife) whilst the DHA was in a major crisis. Need I remind you of the unabridged birth certificate crisis, which was heralded as ‘unprecedented’ by a number of international airlines, a monumental blunder that permanently scarred SA tourism, one of the only hopes of our unemployment crisis? I let you decide if this ‘Gigaba Wrecking Ball’ should be given further rein as Minister of Finance. As for my claims on his hypocrisy, one has to only reflect on last week, at Honourable Ahmed Kathrada’s funeral. I am not the only person dumbfounded by recent events – there have been stringent cries from many a quarter this year. True to his sycophantic and self-serving character, Gigaba has been publicly vocal about any criticism of his master Jacob Zuma. 1) I have never referred to Uncle Kathy in that manner as you insinuate. 2) for you to use this during this time, it’s too low. Always the opportunist, our honourable Minister Gigaba left no political stone unturned, and attended Uncle Kathy’s funeral with a solemn face, virtually carrying the coffin to its grave. When a man holds no scruples, is willing to use the funeral of an anti-apartheid legend to curry for political favour, I pause. What do you do? My final question is on Gigaba’s academic qualifications and experience for this post of Minister of Finance, one of the most important in this land at this juncture, where we are on the cusp of a credit downgrade and the government’s interest bill (as the country’s largest borrower, and paid for by us, the citizens) threatens to explode in the upward direction. He does not even possess a BCom in Finance! We are dealing with an industrialised nation, the 11th largest forex market in the world, with complexities that even the most seasoned financial mind would have trouble grappling with. And he is a lying cheating incompetent hypocrite, whose only ‘attribute’ is a slavish commitment to our beloved President. Are we, collectively as a nation, we the ruling ANC, we the opposition, going to let this happen? If we do, then forever hold your peace as we slide towards Zimbabwe. Abstaining now is tantamount to approval. Don’t cry our beloved country, plan carefully for the imminent motion of ‘No confidence’ in Jacob Zuma to be tabled and approved by parliament. Over to you. Sunil Shah is an entrepreneur and investment professional who has worked as a fund manager for Schroders in London (US Desk) and Coronation in Cape Town (midcap/small cap Fund Manager and Strategist). He is also an author. His debut novel, White Man’s Numbers provides a fascinating insight into the underbelly of financial markets. To read a free sample chapter click here.